Filson has recently announced that some of their most classic (and iconic) styles will begin shipping in a fourth color…Rugged Navy Twill. The underlying fabric is the same 22oz 100% cotton oil-finish twill that we all love and the bags will be trimmed in dark brown bridle leather. The obvious omission from this list is the 257 Briefcase Computer Bag. I am curious why all of the other briefcases (256 and 258) will be offered in Navy, but the 257 will not. Perhaps, this is a subtle clue regarding the relative demand for the 257. 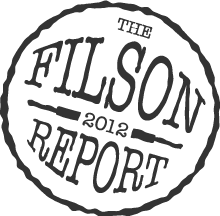 If the new color is a success, I am confident that Filson will roll it out to other styles as production increases. In the past, if you wanted any Filson bag in navy blue, you had to pay a premium and settle for a slightly thinner (and less durable) fabric by ordering a special edition. The demand for this color appears to have been so great that Filson has decided to add it to their standard lineup…and I am very excited about it. Hi Mike…thanks for visiting the site! I have not received my navy blue piece yet as it is still on backorder through Filson. I do know that the navy blue special editions always felt thinner than the tan or otter green pieces. It is a little disappointing to hear that the regular production version of the blue feels thinner or less structured. Thanks for the info and I will be sure to keep you posted when it arrives. Have a great week! 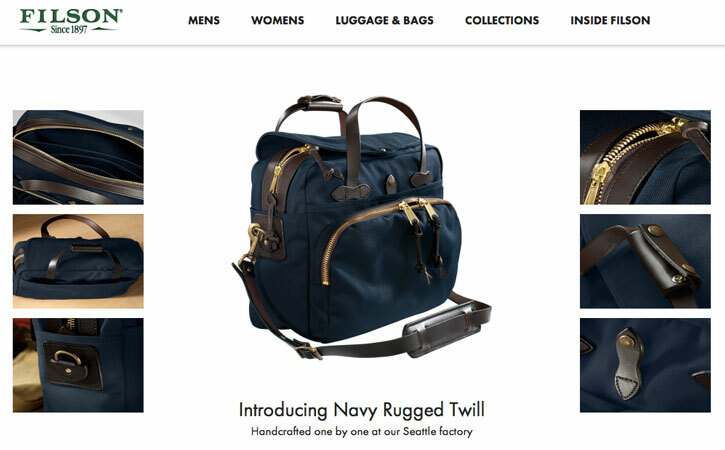 Looks like Filson is experimenting with some new colors. A red 257 (http://www.sierratradingpost.com/filson-large-briefcaseandcomputer-bag~p~6171d/?stpcjid=6147257_226fdab251eb40b8956f77487f71de70&filterString=s~filson-bag%2F&colorFamily=01&PID=6147257&utm_medium=Affiliate_CJ&utm_campaign=ACJ1&utm_source=2470763&codes-processed=true) and a natural 257 (http://www.unionmadegoods.com/UNIONMADE_Naturals_Filson_Large_Briefcase_in_Natural_8214.html). I just purchased the tote without zipper (260) in navy from Hank’s Clothing’s online site. I wasn’t sure what to expect because the navy color for this tote was not on Filson’s website. So before ordering, I called Filson to inquire. Initially, the sales rep. stated that the 260 was not offered in navy. A few days later, the rep. called me back and confirmed that the 260 was offered in navy (I already made the purchase from Hank’s). Now the website has been updated and the price of the 260 has gone up $10. In any event, it’s a sturdy and great looking bag. Thanks for your comment! Very interesting. I have noticed that Filson has raised their prices on a few of their most popular bags. The Filson 257 Computer Briefcase has gone from $275 to $300 and the Filson 256 Original Briefcase has gone from $225 to $248. These increases are not insubstantial, but Made in the USA quality and a 100% satisfaction warranty do not come cheap. You have made a wonderful choice with the 260…enjoy your new bag! Hi Charles, now that the blue is offered where do you stand on the color debate? I loved your post discussing the pros and cons of the classic tan and otter green and that you found the dark brown to be a non-choice due to the lack of contrast. Does the blue fall on the side of the otter green stylistically? Thanks for visiting the site and thank you for the compliment. I would place the new blue bags toward the Otter Green side of the spectrum because there is sufficient contrast to give them a very stylish look and I would expect them to slightly fade over a long period of time. If you tend to have a lot of blue/grey in your wardrobe, then the navy is a wonderful choice! I’m currently torn btw getting the medium travel bag or the sportsman. I like the “look” of the travel bag more but realize that the many diff. compartments of the sportsman would probably be the better choice considering my organization needs…however, another big factor – albeit a rather superficial one – is the colour options! Right now the sportsman is not offered in navy….I was wondering – do you know or think/predict that it might in the near future? If so, I’ll probably consider holding out for it. Thanks for visiting the site! Between the two bags you are considering, I prefer the Medium Travel Bag for most purposes including for use as a carry-on and for weekend trips, etc. If you like the look of it better, I would trust your instincts. The bag has four large pockets on the outside and two full-length pockets on the inside. If you combine those pockets with some packing cubes (from Tom Bihn or Eagle Creek for example) you can create all the organization that you really need. For travel, the subdivisions in the Sportsman are more of a hindrance than a help in many situations. I prefer the flexibility that the packing cubes offer and the ability to customize the bag to your needs makes the Medium Travel Bag the clear winner. The Medium Travel Bag is also lighter, which is always nice. If, on the other hand, you are looking for a great hunting bag, or an organizational solution for the trunk of the car, then the Sportsman becomes the better option. I hope this helps…good luck in your search! December 27, 2013 - 7:27 pm A. A big fan of the website. I’m torn between ordering the Medium Travel Bag in Tan or Navy Blue. Do you have any observations on the navy bag (I’m unsure which model you chose to order from Filson) now that you’ve been using it for some time? The earlier comment about the different finish of the material has left me a little concerned. I recently received the medium duffle in blue and, while it looks gorgeous, I haven’t had a chance to field-test it yet! Thank you for the kind words and thanks for visiting the site. I have a briefcase in the Navy Blue and I really like it a lot, but for a the Medium Travel Bag, I would choose the Otter Green. It just looks a little more rugged to me and seems a little bit more in-line with the historical aesthetic of the brand. I hope this helps! December 30, 2013 - 7:35 pm A.
I agree with what you’ve written regarding certain colours and their relationship to Filson’s ruggedness and historical aesthetic. Since writing my initial message I have had time to think more about the various colours Filson offers and I believe that the blue works best in some pieces, especially smaller ones like the 256 briefcase, but nothing beats the original tan or classic otter-green for the larger pieces of luggage. I’ll make my decision between the tan and otter-green for the travel-bag based on your very helpful advice! Thank you. Will look forward to seeing future updates on your site. Your site is so helpful and informative. For the zippered tote, what color would you choose – the OG or Navy now that both are options now? Pros/Cons? Thanks for your message…I personally own the Otter Green Zippered Tote and I love it. The Navy Blue is a beautiful bag also, but since Otter Green is my favorite Filson color, I usually tend to go in that direction. It fits the rugged Filson-aesthetic just slightly more than the blue, but you can’t go wrong either way. Hope this helps! Hi, and thanks for the informative post. i’m torn between tan and blue for the computer briefcase. what would you recommend for flexibility, ie wearing to work with dark suits but also with a variety of casual wear?